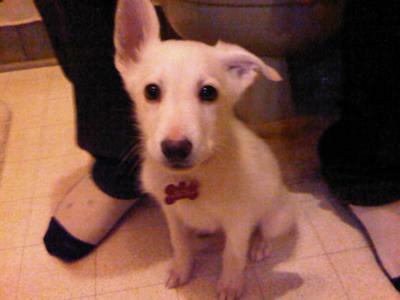 My boyfriend and I bought an all white German Shepherd Lab mix puppy about a month ago from a breeder in London, Ontario. When we got him at 3 months old he was only 9 lbs. The woman only fed him a teaspoon and a half of soft food a day. Also she trained him to go to the bathroom in her kitchen. None of the puppies had ever been outside! All of his bones were showing, and he resorted to eating his own poop due to being soo hungry. Thank God we rescued him when we did! Anyways, he is now 4 months old and only weighs 16.2 pounds. He has almost doubled in the month we have had him and his bones no longer show. But I am worried he will always be small and underweight. Any ideas as to how I could help him to gain weight or will he always be a smaller dog? Please, nobody buy a puppy from a woman named Joyce Lozier!! She is a horrible breeder who should never have had puppies raised in her home. Brusky is adorable... and very lucky!! Keep us all posted on his progress!!! Thank God you rescued the puppy. God only knows what has happened to the other puppies this person has. She should be reported to the right people. In Australia, they are called RSPCA. Here in Australia, we have laws in place for such crime and neglect towards animals. I am so glad Brusky now has a good home. It is appalling to hear how some people treat animals. Now that he's actually being fed, I would expect to see him grow quickly. According to the American Society for Nutrition, a lab at 48 weeks would weigh around 27 pounds. The GSD growth chart shows a weight of 41.8 pounds for a 4 month old German Shepherd. Keep in mind, these numbers are the FCI (international) standard. American GSD lines appear to be bred primarily for show, while in Germany, the breeding places more emphasis on working ability. That's why they tend to be heavier and their backs are not quite as sloped. Because he is a mix, I would venture to guess he should probably be somewhere in between. An average of those two figures is 34.4 pounds. The best thing to help him put on weight would be to feed him a quality dog food. He may still end up being a bit on the small side, but this will give him the best chance to reach his potential. Typically, labs put on 8 pounds a month. He may put on more since he was so starved. 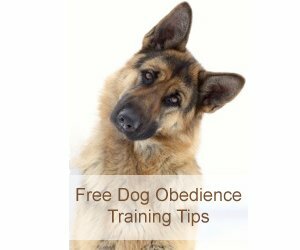 A full grown lab should weigh between 55-70 pounds while a male GSD is normally between 75-90 pounds. Thank you for sharing Brusky's story. Hope that helps. Give him a hug for me - he's a cute little fella! Keep in touch and let us know how he's progressing.